Domo Tactical Communications (DTC), a leading developer of surveillance, communications and broadcast technologies for unmanned aerial vehicles (UAVs) and other unmanned vehicles, has partnered with Unmanned Systems Technology (“UST”) to demonstrate their expertise in this field. The ‘Silver’ profile highlights the benefits of DTC’s Software Defined Radios (SDRs) and IP Mesh solutions for UAV and UGV (Unmanned Ground Vehicle) communications and data transmissions. 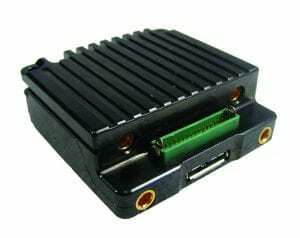 The SOLO8 Software Defined Radio is an ultra-miniature COFDM digital video transceiver designed specifically for integration into highly space-constrained applications, such as small unmanned aircraft systems (sUAS). The system is capable of operating as a Transmitter, Dual Encoder, Standard IP Mesh or MIMO (Multiple Input Multiple Output) IP Mesh. The system is built on an exceptionally low SWaP footprint and features dual high profile HD H.264 independent video encoders, dual SD/HD-SDI video inputs and two 100mW COFDM transceivers. The high image quality offered by the SOLO8 makes it ideal for applications such as intelligence gathering, identification and monitoring, and law enforcement. 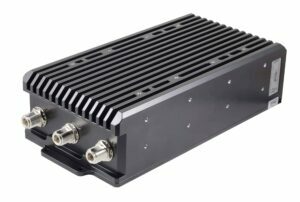 The NETNode Robust 5W IP Mesh Radio delivers secure data exchange between wireless nodes in point-to-point or point-to-multipoint configurations and is ideally suited for use in surveillance, command and control, or robotic/autonomous applications, including Unmanned Surface Vessels (USVs). Up to sixteen of these NETNode Phase 4 IP Radios can be combined in a fluid self-forming, self-healing mesh that exchanges data on a single frequency, simplifying frequency management. The entire mesh occupies just 2.5MHz of bandwidth, with other bandwidth options available. 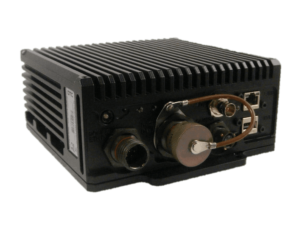 The NETNode 5RM Robust Mobile IP Mesh Radio is DTC’s latest generation of radio and is ideal for extended outdoor operation, providing robust encrypted, tactical, mobile communication links for the transfer, exchange and dissemination of live data between UAVs, dismounted soldiers, and maritime platforms. The radio features built-in dual HD video encoders and MIMO capability, as well as a Garmin GPS receiver, composite and SDI video inputs, and DES encryption (AES128 or AES256 options available).